Ryker entered Fort Fido's lobby this morning with curiosity and confidence. 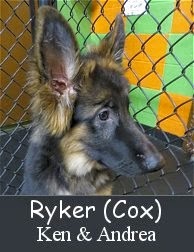 He is a four month old, forty pound, German Shepherd, who was here for his Assessment Day. Being quite familiar with the breed, and Knowing that German Shepherds are "a lot of Dog", we had Ryker get accustomed to the Big Roll right away. Once inside the play area, he explored happily. As we introduced him to some other canines, he communicated with them rather well, especially for such a young dog. As time passed and the pack grew, Ryker continued to enjoy himself. He played quite hard, with several different pack members, and it was a joy to witness. Ryker's owners are doing a very good job with him, and he is on the right track to becoming a calm and well balanced adult dog. Wonderful job today Ryker, we shall meet again soon! Welcome Cooper on this fine Veteran's Day! Hits from the Big Roll!